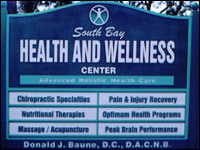 The South Bay Health and Wellness Center is the inspired dream of Don and Nancy Baune. 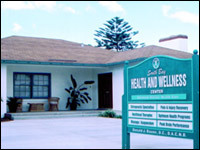 A place for joy, healing, peace, love and light, the Center includes several independent but complementary components. Dr. Baune welcomes you to his practice in a warm, friendly home-like environment. Don’t let the cozy atmosphere fool you though; this facility is an advanced, state-of-the-art chiropractic treatment facility. This teaching and activity facility will encompass the latest in wellness education, and will include seminars and classes on Bio-Kinetics Self-Care / Stress Response Training, Yoga, Pilates, Gymnastic Ball, Wellness groups, and many other topics. Come and be pampered. Experience a body and mind renewal in this serene environment that offers various types of massage and bodywork, acupuncture, and health related body scrubs and cleansing programs. A little bit of heaven within the city. Come and be at peace in this beautiful relaxing setting. Open to all patients during normal business hours. “It is important from time to time to slow down, to go away by yourself and simply Be.” Eileen Caddy, The Dawn of Change.